A single family villa community located within the shadows of the “Golden Dome” across the street from the University of Notre Dame. Featuring upscale detached single family custom homes with basements starting in the $200,000's and built by the builder of your choice. We currently have some completed homes now available. Imagine walking across the street on game day to enjoy all the activities and traditions associated with a Notre Dame Football weekend or walking and biking around the 1500 acre campus during the less busy times. Also located convenient to Saint Mary's and Holy Cross Colleges, the City of South Bend, Restaurants, Shopping, and the Indiana 80/90 Toll Road. This neighborhood features sidewalks, street lights, two ponds and an exterior maintenance program for a care free lifestyle. 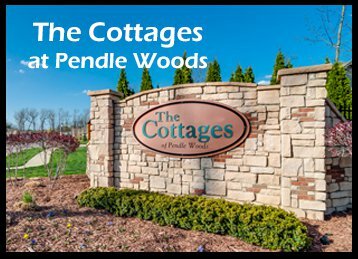 Homes in The Cottages of Pendle Woods include a generous selection of standard features and are able to be customized as desired by the builder. Please take a moment to view this website and let us know if you have any questions or would like to set an appointment. Located Just North of the Notre Dame Campus!